Trusted. Tested. Standing up for us. Democrat Gary Farmer is Broward’s progressive voice. 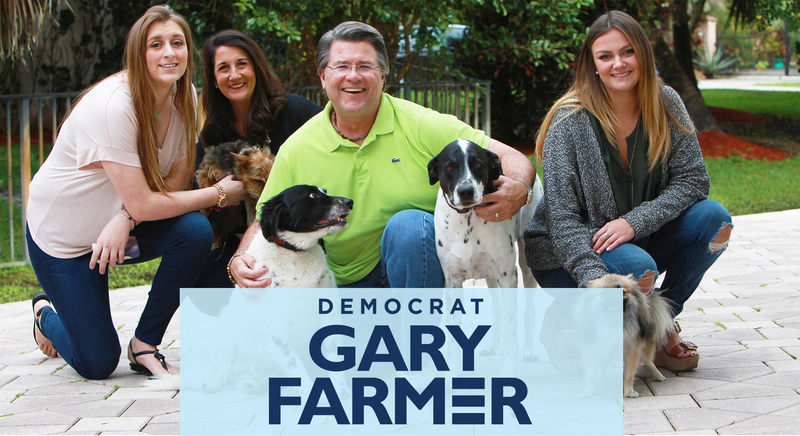 Democrat Gary Farmer is a Progressive, lifelong Broward resident, and an advocator for the rights of the people. Funding Our Schools and Raising Teacher Pay: Gary is committed to making sure our schools have the resources they need to provide an excellent education for every child, and he knows our teachers deserve a meaningful pay raise. Standing Up for Women’s Rights and Equal Pay: Gary is a lifelong advocate for women. He strongly supports a woman’s right to choose and equal way for equal work. Increasing Access to Affordable Health Care: We must expand Medicaid and close Florida’s coverage gap. Gary will work to make health care more affordable for all families and lower prescription drug costs to help us make ends meet. Standing With Our Teachers and Against the NRA: Gary Farmer has stood up to the NRA repeatedly in his fight to ban assault weapons, expand background checks, and block reckless attempts to arm teachers with guns.